Easy fondue at home! With this personal fondue mug set by Kovot, melt cheese or chocolate for dipping fruit, veggies, breads and more. Ceramic personal fondue mugs feature bottom openings for tea lights (not included) to heat your favorite dip. 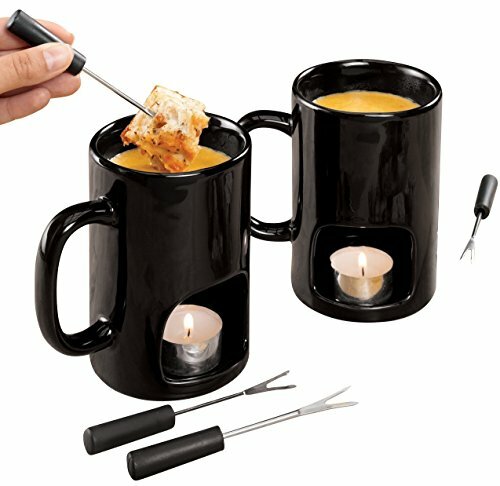 Set of 2 fondue mugs and 4 dipping forks. In order for the tea light to burn most efficiently, make sure there is air flow (I.e. fan/window) so that the flame does not suffocate. Microwave and dishwasher safe. Black mugs measure 3″L x 5″W x 4 3/4″H. Forks are 4 5/8″L . Mugs Measure 3?L x 5?W x 4 3/4?H. Forks are 4 5/8?L.